Image tuner is a free photo editing software for the Windows operating system. It can be used to perform a basic set of operations on images including batch resizing, converting, watermarking and renaming digital photos and images. The photo editing software has been specifically designed to assist webmasters and users in publishing optimized photos on the Internet, but can also be used for other photo editing purposes. 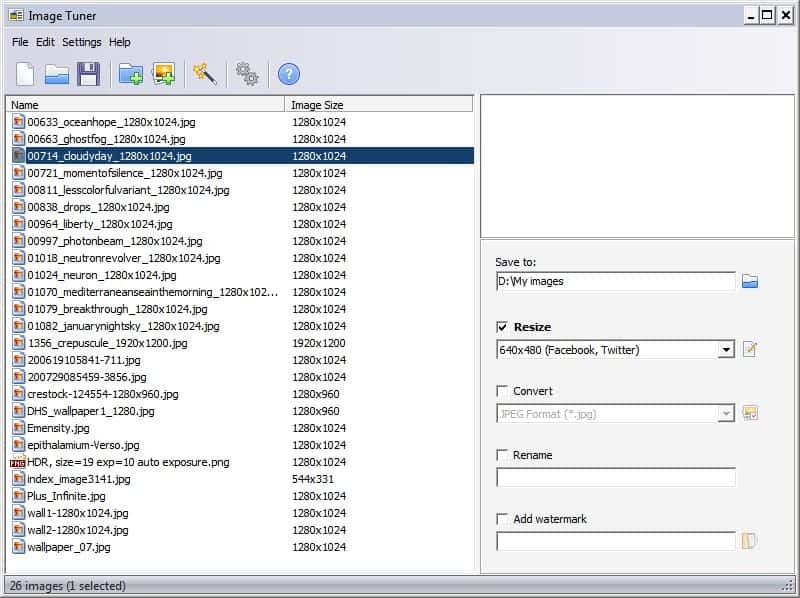 Photos can be added to the program's processing queue by dragging and dropping them on the program interface, or by using the file browser which offers a handy option to add all images located in a folder. Each image is displayed with its name, resolution, type and path in the interface afterwards. You can change the default display mode to a thumbnail view mode instead if you prefer it. This mode displays images as thumbnails, but lacks some of the information of the list view mode. The photo editing options are located in the right sidebar. A click on the plus icon enables you to add tasks that you want the program to run. This includes among others options to resize or convert images, to add watermarks, remove EXIF information, or rename images. Some of the tools come with presets. The resize operation for instance lets you resize the photos so that they match the default resolution of devices such as Apple's iPod or iPhone, or websites such as Twitter or Facebook. It is naturally also possible to set custom resolutions for the images. The photo conversion module supports the most common image formats including jpg and png among others. Image Tuner supports several other image editing options including rotating or cropping images. All of those can be applied to individual images or images in batch mode. A few photo editing options can be changed in the program's settings. This ranges from the opacity level of the watermarks to the compression level of converted jpg images. Image Tuner is a handy photo editing software that's especially useful to batch process images on the local computer system. Update: The program has been updated several times in recent time. The options on the right have been improved considerable for instance. There is a new effect menu for instance that you can use to perform operations such as rotating images, colorizing them or flipping them. The list of images furthermore displays the path and the file type as well as the image name and resolution.